SPARCK has developed a partnership with Editions de l’Oeil, a Paris-based publishing house widely known in the art world for its innovative publication practices as relates, notably, to contemporary African art. Among Editions de l’Oeil’s best-known publications are works that have come out in a collection entitled Carnets de la création. To date, 98 volumes have been published in this collection. All are pocket-sized books, each dedicated to one artist. The books are characterised by high-end colour reproductions, graphics and design, and by short, incisive and highly readable critical texts penned by specialists. A key feature of the collection is its affordability (5.50 Euros per volume): the small dimension of the books renders shipping affordable and the company’s focus on self-distribution does away with disbursements that would increase sales cost. This, combined with quality of content and bi- (or tri-) lingual text (French, English, Portuguese/Spanish), makes for a series that is considered to be a must-have and that is widely available in community centres, public libraries and non-profit organisations. The 99th Carnets de la création volume is dedicated to the work of SPARCK’s first artist in residence: Kakudji. The focus of this book is on works created by Kakudji during his April 2009 SPARCK residency in Cape Town. Accompanying text is by Cape Town-based writer and filmmaker Stacy Hardy. It appears in French and in the original English. 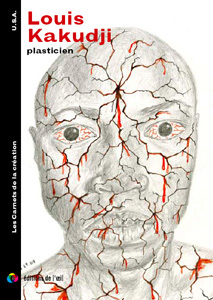 The volume is a co-production of Editions de l’Oeil and SPARCK with the support of the Africa Centre and CEMAf / CNRS - Centre d’Etudes des Mondes Africains / Centre National de la Recherche Scientifique (Paris). As a result of this collaboration, Editions de l’Oeil has approached SPARCK to develop a much broader undertaking: the publication over five years of a series of fifty volumes focused on artists working with SPARCK, for which funding is being sought. A key aspect of the project, for which SPARCK would take principal responsibility, would be to develop an Africa-based distribution network centred on de-centralisation. Funding, in this context, would not only cover production and shipping costs, but also subsidise the sale of books, lowering the cost per item to under 2 Euros, and allow on-the-ground, targeted research to identify collectives, non-profit cultural and community organisations and research institutions in Africa with which distribution partnerships can be created, ensuring that the books find homes in spaces where they are most likely to be useful and to be shared with as large and diverse a public as possible. Parties interested in supporting this project are welcome to contact SPARCK.